St Catherine’s Youth Group are going to ‘sleep out’ in the church hall for Launchpad Reading because they help vulnerable single homeless people. Please sponsor one of them, or visit their ‘Just Giving‘ page to donate. Launchpad Reading give people in Reading a second chance… it’s something everyone deserves.. We’ve all made mistakes. But it’s not always easy to get back on a stable path. That’s where Launchpad help providing a place to live, skills to live independently and the confidence to get into employment. This takes place on the evening of Friday 4th through to the morning of Saturday 5th. Click here for their Just Giving page. 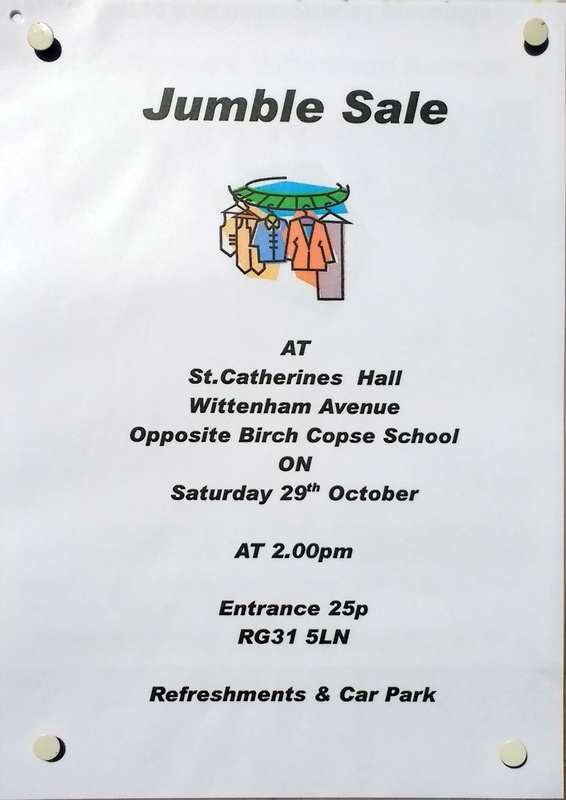 There is a Jumble Sale in St Catherine’s Hall on Saturday 29th October, opening at 2:00 pm. Entrance 25p. Refreshments and car parking are available. Editors note : Denis formally left our parish on 14th October. Here’s his farewell message which appeared in the magazine. I have been doing a Farewell tour of all the local schools that I have regularly visited in Tilehurst and Calcot. We have been thinking about Goodbyes and Farewells. Apparently centuries ago the two greetings went together “Faren Well” to the person departing, and the response “Good bye”, which of course came from the phrase “God be with you”. In the School Assemblies our song to finish has been, “God has put a circle round us” by my friend Jenny Dann – which has been sung many times in all the schools. That song is really an “encircling prayer” emphasising the reality of God sending Jesus to be with us, and Jesus seeing the Holy Spirit is sent. When Jesus left this earth he promised the Holy Spirit, and his followers were told to get on with living and stop staring up at the sky. God would provide a new way. Life with God would go on, as it will still go on in the years to come here in Tilehurst and Calcot. 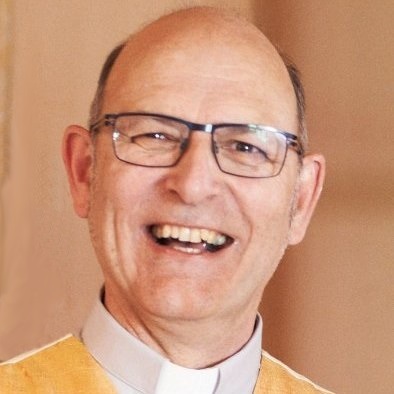 Priscilla and I are not going far, only to Basingstoke, from there I will still help in the Diocese of Oxford by Coordinating their “Conflict Transformation Team” and do similar work outside the Diocese. I will also be involved in helping the various Christian Healing organisations I have supported over the years, Crowhurst in Sussex, Harnhill near Cirencester and CHM in London. So I’ll be working in the power of the same Holy Spirit in new ways. So to all the people of faith here, may you be encircled with the presence of God and carry on doing the job of being the people of God in this place. It has been a privilege to serve the community for 14 years, a time of many changes and many blessings. When a new person arrives there will be changes again, and new things will become important. Be an encourager of one another, and welcome and encourage your new minister. I hope that some of the things I have done and said have made you think about Jesus and helped you on your journey of faith. So as you say Farewell – I say Good bye. May the love of God encircle us all, and the Holy Spirit empower us in Jesus’ name. The October issue of RG31 – our Parish Magazine – is now available on-line here, or click on the image.